We know that sun exposure can be deadly, and today’s public awareness campaigns strongly focus on sun avoidance to prevent skin cancer. But we also know that sunlight is important to our health and plays a role in many biological processes in our bodies. In fact, some physicians and scientists are taking a closer look at sunlight to expose the lesser known benefits of ultraviolet (UV) light. When we are talking about the dangerous component of sunlight, we are really talking UV light. UV light is ionizing radiation, meaning that it frees electrons from atoms or molecules, causing chemical reactions. UV light is divided into three categories listed in order of increasing energy: UVA, UVB, UVC. UVC is the most harmful, but the ozone layer and other components of the atmosphere filter all of it out before it reaches us. Thats also the case for a large percentage of UVB light. But nearly all UVA light reaches the Earths surface. Both latitude and season play large factors in our individual exposure to UV radiation. Countries farthest from the equator during winter months receive the least amount of UV radiation, while equatorial countries receive the most. Unlike visible light, the energy from UV radiation can be absorbed by molecules in our body, causing chemical reactions. When the energy from UV radiation is absorbed by DNA, it can cause reactions that lead to genetic mutations. Some of these mutations can lead to the development of skin cancer, which is the most common cancer in the U.S. Basal cell carcinoma, squamous cell carcinoma and malignant melanoma (one of the deadliest cancers) are all associated with UV light exposure. However, not all chemical reactions that UV light induces are harmful. In fact, some of them are beneficial. For instance, we can get vitamin D from eating certain plants and animals, but a main source of vitamin D comes from exposure to UV radiation. Vitamin D is critical to maintaining bone density by increasing calcium absorption in the gut. Chronically low levels of vitamin D can lead to osteoporosis. Apart from its effects on bone, vitamin D has also been shown to improve balance and muscle strength in the elderly, which decreases the number of falls leading to fracture. Research suggests that the risk of developing lung, prostate, breast, colorectal and pancreatic cancer may be decreased by sun exposure. This protective effect against cancer is most pronounced in sunny countries. While smaller studies of colorectal and prostate cancer have conflicted with this finding, many studies support a beneficial relationship between sun exposure and internal cancers, and it has been suggested that the risks associated with sun exposure may be outweighed by its ability to prevent certain types of internal cancers. Sunlight may also improve cancer outcomes. The prognosis for patients diagnosed in summer and fall is better than those diagnosed in winter, and total sun exposure prior to diagnosis is a predictor of survival. Given the relationship between sun exposure and vitamin D production, it was initially thought that vitamin D was the underlying cause for improved cancer outcomes. Unfortunately, data to support this are still lacking. Initial trials of vitamin D supplementation have failed to demonstrate a benefit on cancer prevention, which has led researchers to believe that this benefit is from the effects of UV radiation. UV exposure positively affects blood pressure as well. People living in countries in higher latitudes with less UV exposure have higher blood pressures at baseline than countries receiving more sunlight. This effect is also seasonal, as more UV exposure in summer results in lower blood pressure. And clinical trials have proven UVB radiation effectively treats patients with mild hypertension. It was thought that vitamin D was the cause for decreased blood pressure, but follow-up trials proved this effect was due to UVB exposure alone. Some chemical reactions caused by UV light are known to have anti-inflammatory effects in the skin. Immune cells living in the skin can stop functioning, migrate out of the skin or undergo cell death following exposure to UV radiation. Due to its anti-inflammatory effects, UV light can be used to effectively treat inflammatory skin conditions like psoriasis and eczema. On a larger scale, certain autoimmune conditions are more common in countries with less UV exposure. For instance, there is a higher prevalence of multiple sclerosis (MS) in Scandinavian countries. In MS, immune cells attack the insulation around nerve cells in the brain, ultimately leading to nerve damage. While lack of vitamin D is a leading hypothesis for how MS develops, studies have also shown that lack of sun exposure may be an independent risk factor for nerve damage. In addition to skin cancer, UV radiation also causes photoaging. UVA radiation penetrates deep into the skin, destroying collagen, which leads to wrinkles and skin thinning. Also, some autoimmune diseases, such as lupus, flare in response to UV radiation. UV radiation can also affect the eye, causing cataracts. So, how can you maximize the benefits of sun exposure while minimizing your risk of skin cancer and aging? The key is to practice safe sun habits, which means using sunscreen and avoiding sunburns. This will decrease photoaging, and more importantly, your risk of skin cancer. Also, vitamin D is most effectively synthesized at UV radiation doses below those causing sunburn. Several factors, including your skin type, latitude, longitude and weather, play into your overall UV exposure. 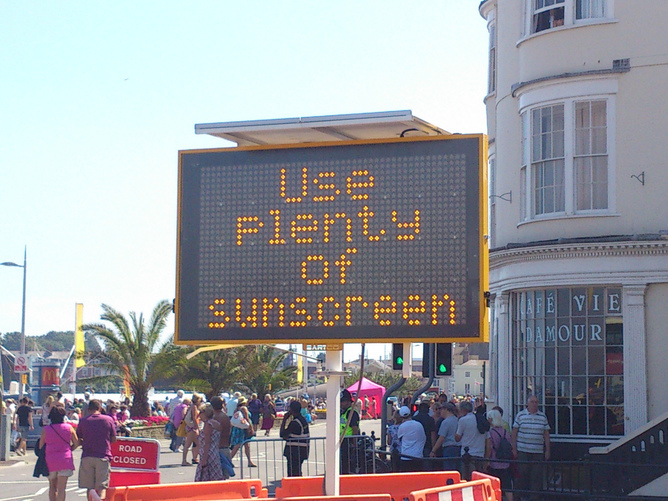 This means different amounts of time in the sun for different people. People living in California may need only brief sun exposure on a cloudless day for adequate vitamin D production. This differs for places like Boston, where there aren’t adequate amounts of UV radiation from November to February. Skin type becomes important because melanin, which gives skin its pigment, effectively blocks UV radiation. This means darker-skinned people need more UV exposure for adequate vitamin D production than lighter-skinned people. There are online tools that let you calculate how much time you should spend in the sun to achieve adequate levels of vitamin D without causing sunburn. If you think you aren’t getting enough sun exposure, or you live somewhere with long winters, check with your doctor to see if you are vitamin D deficient. CHECK OUT: Top Rated Dark Spot Removers For Face And Skin !